Party Palace creates themed birthday parties in the comfort of your home. They offer several party packages tailored to make your child’s special day magical. Their current themes are Princess Tea Parties, Fairy, Diva, Spa, Pirate and Super Hero parties with a wonderful layaway that special day option. They have been creating memories that last a lifetime since 2001. 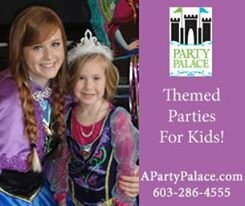 I am happy to feature A Party Palace as one of NH Kids’ favorite party businesses! Thank you so much for your comment! I will check out her site and add her to the site.